Includes two PI30-SP speakers & two PI30-PS speakers. Dual ceiling-mounted infrared receivers (twice the industry norm) pick up the wireless audio from the two microphones without disruption. Two sensors help prevent signal drop outs so none of the message gets lost while enabling the system to be used in classrooms up to twice the size of the average elementary classroom, or about 2,000 square feet. Connecting to either MAC, PC or Android systems, the Infrared system amplifies audio from computers and other audio sources. It also connects to teleconferencing systems for distance learning opportunities as well as FaceTime® and Skype® sessions. 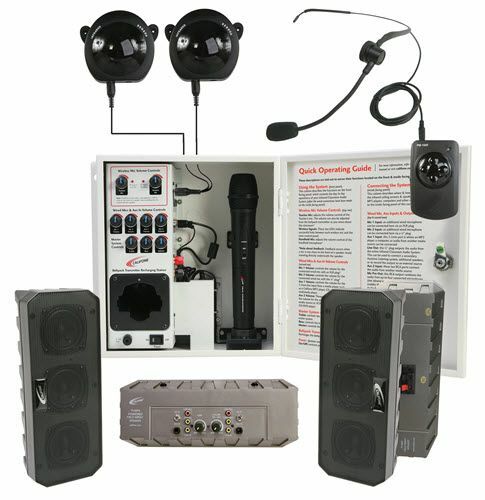 It has an additional output to connect assistive listening devices for special needs students. 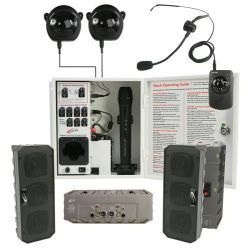 Each system includes a lightweight rechargeable belt pack transmitter with a comfortable headset mic for teachers and a handheld wireless mic for students (on separate wireless channels in order to support co-presenters).